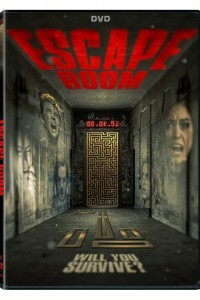 In the Escape Room DVD, for Tyler’s 30th birthday, his girlfriend Christen gets him an unusual gift: admission to a mysterious escape room event. As they enter with four friends, they find themselves trapped in bizarre rooms where they must solve tricky puzzles in order to advance. But Christen has disappeared, and Tyler is shocked to see her on a video monitor, naked and trapped in a cage while the seconds count down. When the cruel game begins to turn deadly, he realizes they may not all escape with their lives.